Botanical Name: 1. Prunus japonica Thunb. ; 2. Prunus humilis Bge. ; 3. Prunus tomentosa Thunb. Part Used & Method for Pharmaceutical Preparations: The ripe seeds from the fruit are gathered in autumn and dried in the sun. The seeds are then ground in a mortar and pestle. Properties & Taste: Pungent, bitter and neutral. Meridians: Small and large intestines. 1. Constipation due to dryness in the intestines. 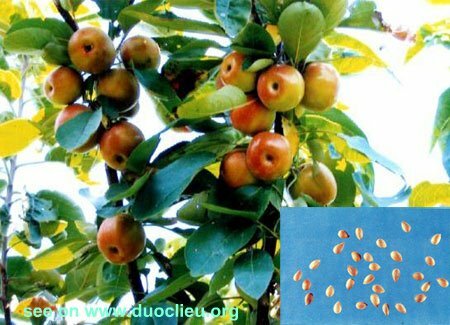 Bush-cherry seed (Yuliren) is used with Apricot seed (Xingren), Peach seed (Taoren) and Arborvitae seed (Baiziren) in the formula Wuren Wan. 2. Edema. Bush-cherry seed (Yuliren) is used with Mulberry bark (Sangbaipi), Phaseolus seed (Chixiaodou) and Imperata rhizome (Baimaogen) in the formula Yuliren Tang. Cautions & Contraindications: This herb is contraindicated in cases with depletion of body fluids, or during pregnancy.